Over the past three years, my involvement in the EU lifelong learning project iTILT (interactive Technologies In Language Teaching) has provided an opportunity to investigate the potential of the interactive whiteboard (IWB) for language teaching and learning. As associate professor in the English department at the University of Nice in France, I teach EFL, train pre- and in-service primary and secondary language teachers, and research questions of second language acquisition and teaching. Different aspects of this professional context have led to my interest in learning technologies in state school language classrooms, particularly in relation to interactional opportunities for learners, and professional development for their teachers. Our project on the IWB for communicative language teaching has allowed me to research these issues from both learner and teacher perspectives. IWBs are deceptively complex and to fully utilise the interactive aspects of the technology, teachers must invest time to build confidence, design resources, adapt practices and learn to harness their power. In order to train our teachers in the iTILT project, we designed task-based materials to support communicative activities at the IWB for learners at a variety of different levels and ages. We created IWB files to support complete teaching units, based on a series of communicatively oriented activities to promote interaction in the target language as well as reflection on language in a meaningful context, all with respect to a final task in accordance with the principles of task-based language teaching (TBLT). Each file included teacher notes with guidance on pedagogical objectives as well as technical information, to encourage a focus on good teaching practice rather than on narrower technological issues. We then used these materials to train our project teachers to exploit the IWB in their own teaching contexts (Whyte, Cutrim Schmid & van Hazebrouck, 2011; see sample materials). only two teachers designed and implemented a significant proportion of task-oriented activities. The majority of video examples of IWB-supported classroom language teaching more closely resembled pedagogical exercises with a focus on decontextualised language practice and error correction. a greater focus on listening, speaking, reading and writing (but also vocabulary) with younger learners in Wales, France and Spain, as opposed to more attention to sub-skills and culture with older, university learners (grammar and culture in Belgium and the Netherlands, and grammar and vocabulary in Turkish universities). In fact the single most common teaching objective among the primary teachers in the project was vocabulary (seen in 25% of Welsh clips, and 26% of French). For secondary teachers in Spain and Germany speaking was the preferred objective (24% and 34% respectively), with grammar for the secondary and university teachers in Belgium and the Netherlands (27%) and Turkey (49%). Many iTILT project teachers were therefore using the IWB for somewhat conservative teaching objectives involving the learning of the words and rules of the target language, as opposed to broader, interactional objectives such as understanding spoken language or producing written texts, for example. In a similar vein, we found that many teachers used a restricted set of IWB tools and features in their lessons. Specific IWB features include tools like the pen, eraser, spotlight or curtain, and functionalities such as drag and drop, hide and reveal, or embedding multimedia resources. Many video examples featured images or links to websites, and basic actions like drag and drop to rearrange objects on the display. In the classroom, there will generally be specific learning goals, devised by the teacher, and this can result in the teacher exerting complete control over the board in its role as classroom hub, leading to the conclusion that the board can be a ‘teacher-centric’ tool (Wall et al. 2005) which encourages teachers to teach ‘from the front’ (Smith 2001). In our project, however, three quarters of the video examples of IWB-mediated language teaching selected for the iTILT website showed learners using the IWB, rather than teachers. Only in Belgium and the Netherlands was the balance of examples in favour of teacher-led activities. This finding confirms an earlier analysis of pre-training questionnaires administered to all project teachers. In that study, we compared teachers’ reports of their confidence in using the IWB (and ICT in general) with their reported practice. (We use the term self-efficacy, of which more below). Despite low levels of IWB self-efficacy, the teachers indicated that they still allowed their learners to use the IWB. This suggests that a perceived lack of self-efficacy in IWB technical skills does not necessarily prevent them from conceptualising the importance of the IWB for teaching and learning, or deter them from allowing learners to use the IWB. Nevertheless, in the Whyte, Beauchamp & Alexander (2014) study, we also note that almost four out of five of the frequently observed learner-centred examples of IWB teaching involved a single learner or series of individual learners at the IWB (160/201 video clips). This means that instead of organising pair or group work at the IWB, for example, the teachers maintained control of IWB access in whole-class teaching by designating individual learners to manipulate the IWB. First, teachers are not particularly comfortable using the different tools and features of the board, irrespective of length of experience with the IWB and in spite of confidence in general ICT skills. Second, it shows a somewhat conservative or cautious approach to IWB use for language teaching, with teachers focusing on a limited repertoire of basic functions such as dragging and dropping images to fulfil relatively circumscribed language learning objectives (vocabularly, pronunciation, receptive skills), often with a teaching method involving an individual learner working at the IWB before the class. More details regarding these findings are given in Whyte, Beauchamp and Alexander (2014), and examples of the different types of IWB use in language teaching can be accessed via the iTILT website’s quick search feature. 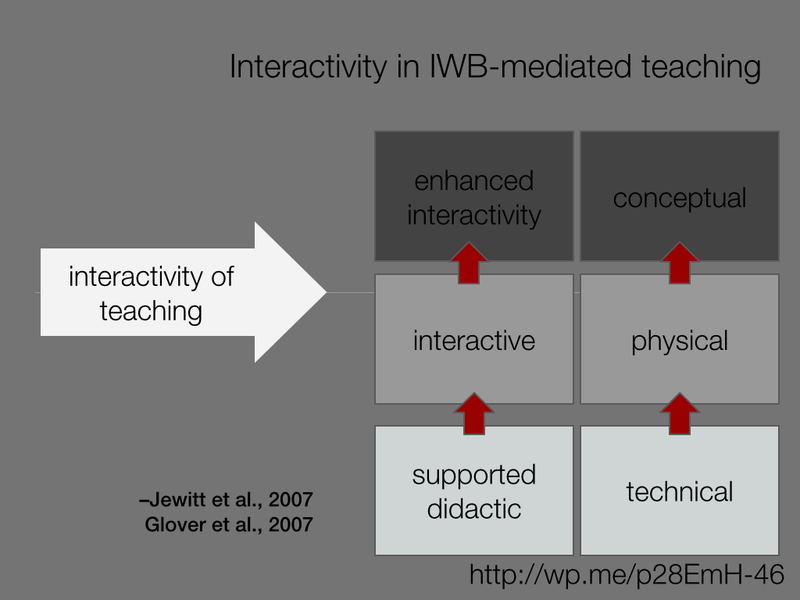 One explanation of our findings regarding teachers’ choice of teaching activities, and use of the IWB in general, can be found in the literature on the integration of interactive technologies in education. 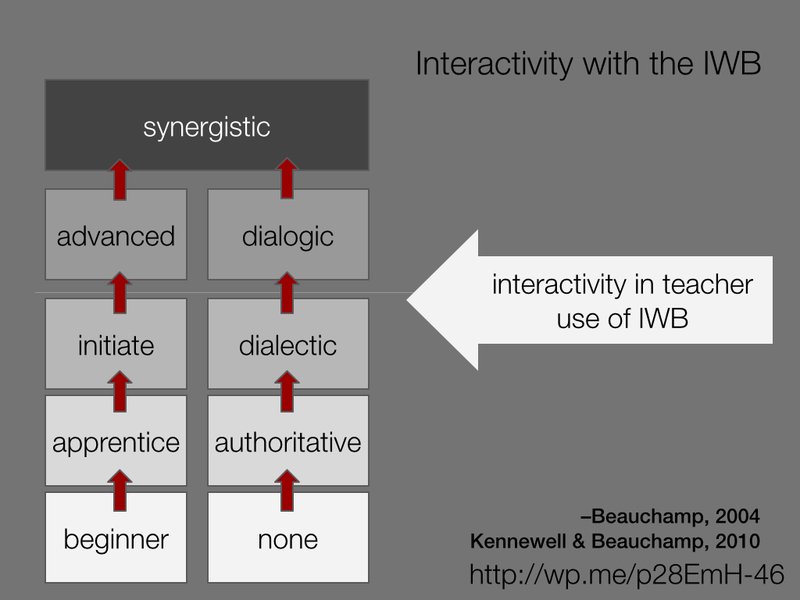 A number of studies have traced the different stages of teacher development from a novice approach to the IWB as a “blackboard substitute” with little interactivity, to “synergistic” levels of “enhanced,” “conceptual” interactivity, as shown in this graphic (Whyte, Cutrim Schmid, & Beauchamp, 2014; see also Whyte, 2014). the effective use of IWBs involves striking a balance between providing a clear structure for a well-resourced lesson and retaining the capacity for more spontaneous adaptation of the lesson as it proceeds. This brings us to the question of pedagogical innovation, since exploiting the full potential of the IWB seems to require the language teachers in our studies to change the way they design and implement teaching and learning activities in the classroom. Teachers may be influenced in their approach to integrating interactive technologies by their own beliefs about teaching and learning with technology, and by other elements of their professional contexts. One approach to studying the influence of people’s beliefs on their behaviour involves Bandura’s notion of self-efficacy. I like technology and so it’s true it’s something that naturally attracts me. I find that it does offer tools and can enrich all our classes a lot and open up opportunities for variety and for creating interactive situations. There are still lots of possibilities that I still have to explore because it’s true that you learn progressively and extend your range. English is the only subject where I do workstations. When I use the board in French or mathematics it is collective. It’s interactive but whole-class. And I am thinking for next year – because every year I change something – and perhaps in mathematics one day every week I’ll do work stations in mathematics. The problem is to find enough time to create IWB files and to try new ideas. We readily understand that those teachers who value the affordances of the IWB and who are keen to develop their IWB skills are more likely to make changes in the way they teach. Conversely, teachers who doubt the value of the IWB – or technology in general – for language teaching are less likely to pursue opportunities for pedagogical change, as the examples in the following section show. I think that, you know, the kids of today with all these screens, I think we should have a bit of perspective. A ‘screen’ is also, you know, something you don’t want to see, right? You hide behind a screen. We have to be very careful. It’s obviously a very big defeat for the classical idea of learning by rote, learning pattern drills. It’s a fabulous tool but I feel it’s more a toy for me and the children than something that’s really essential. The IWB isn’t the most important thing, it’s the notion you want to get across. And the IWB is a tool. You should start with ‘What do I need to do pedagogically?’ and then ‘Now I’ll use the IWB.’ Don’t say, ‘I’m using the IWB and I’ll throw in some activities.’ It’s a tool, not a end in itself. Teachers’ beliefs may be developed individually based on previous experience, but may also change through collaboration. One approach to studying collaborative development is based on Lave and Wenger’s (1991) notions of situated learning in communities of practice. Through their involvement in the iTILT project, the French teachers formed a community of practice in the sense of a rather informal group with a shared purpose and task, allowing for peer-to-peer rather than hierarchical exchanges, and the possibility for differing levels of engagement, and involving learning in context, yet also in informal settings (Whyte, in press, Chapter 4). T1: I think it’s helped us to get a lot of perspective on how we teach. To do with our class organisation, teacher-centred delivery, all that. And that has made us think. R: So nothing to do with the tool, it’s the pedagogy? T1: It’s having worked in this project. T2: You could have come and filmed us and we could have analysed our teaching practice. But here it was in a project with a website, so it was less demanding. T3: That wasn’t what we thought at the beginning. We didn’t say ‘OK this is going to help me analyse my teaching.’ Not at all. That came after. T1: Yes, and we were able to put it into context to because there were lots of us, different nationalities, different people to see, different ways of teaching. Something that in our professional careers we don’t have to chance to see. This exchange hints at the value of informal learning in encouraging innovative teaching in relation to technology adoption. First, as the discussion above might predict, we found that those teachers with greater technological fluency and self-efficacy beliefs, and who were ready to set their own professional development agenda, were more likely to implement pedagogical innovation in their technology-mediated teaching (Whyte, in press). Second, as other studies have shown (e.g., Guichon & Hauck, 2011), pedagogical concerns need to take precedence over technological questions. Indeed, the pedagogical issues related to IWB use discussed here share many common features with other tools and devices, such as task design, materials preparation, and the implementation of activities. These questions go beyond the specificities of the IWB, and are of direct relevance to the classroom use of tablets and smartphones, for example. Third, our work has shown the advantages of a collaborative action research approach where teachers are actors rather than subjects of classroom research (Burns, 2005). It has also developed a number of research instruments for the investigation of technology use in the classroom (Whyte, Cutrim Schmid, van Hazebrouck & Oberhofer, 2013; Whyte, Beauchamp & Alexander, 2014; Whyte, in press). In this way, research from the iTILT project prepares the ground for further research into the interactional opportunities which different interactive technologies can provide in the hands of committed practitioners in a supportive environment. Bandura, A. (1993) Perceived Self-Efficacy in Cognitive Development and Functioning. Educational Psychologist, 28(2), 117-148. Beauchamp, G. (2004). Teacher use of the interactive whiteboard (IWB) in primary schools – towards an effective transition framework. Technology. Pedagogy and Education, 13, (3), 327-348. Beauchamp, G. and Kennewell, S. (2010). Interactivity in the classroom and its impact on learning. Computers & Education, 54, 759-766. Beauchamp, G., & Kennewell, S. (2013). Transition in pedagogical orchestration using the interactive whiteboard. Education and Information Technologies, 18(2), 179-191. Borg, S. 2009. Teacher cognition and language education. London: Continuum. Burns, A. (2005). Action research: An evolving paradigm? Language Teaching, 38(2), 57–74. Gillen, J., Kleine Staarman, J., Littleton, K., Mercer, N., & Twiner, A. (2007), A Learning Revolution? Investigating Pedagogic Practice Around Interactive Whiteboards in British Primary Schools, Learning, Media and Technology, 32(3). 243-256. Glover, D., Miller, D., Averis, D. and Door, V. (2007). The evolution of an effective pedagogy for teachers using the interactive whiteboard in mathematics and modern languages: an empirical analysis from the secondary sector’, Learning, Media and Technology, 32, (1), 5-20. Gray, C. (2010). Meeting Teachers’ Real Needs: New Tools in the Secondary Modern Foreign Languages Classroom. In Thomas, M. & Cutrim Schmid, E. (Eds. ), Interactive Whiteboards for Education: Theory, Research and Practice. Information Science Reference, Hershey, NY, 69–85. Guichon, N. & Hauck, M. (2011). Teacher education research in CALL and CMC: more in demand than ever. ReCALL, 23(3): 187-199. Jewitt, C., Moss, G. and Cardini, A. (2007), ‘Pace, interactivity and multimodality in teachers’ design of texts for interactive whiteboards in the secondary school classroom’, Learning, Media and Technology, 32, (3), 303-317. Smith, H. (2001). Smartboard evaluation: final report. Kent County Council. Wall, K., Higgins, S., & Smith, H. (2005). ‘The visual helps me understand the complicated things’: pupil views of teaching and learning with interactive whiteboards. British Journal Of Educational Technology, 36(5), 851–867. Whyte, S. (in press). Implementing and researching technological innovation in language teaching: a case study of interactive whiteboards for EFL in French schools. New language learning and teaching environments (Series editor: Hayo Reinders.) Palgrave Macmillan, April 2015. Emily Hillier, Cardiff Metropolitan University, Wales.